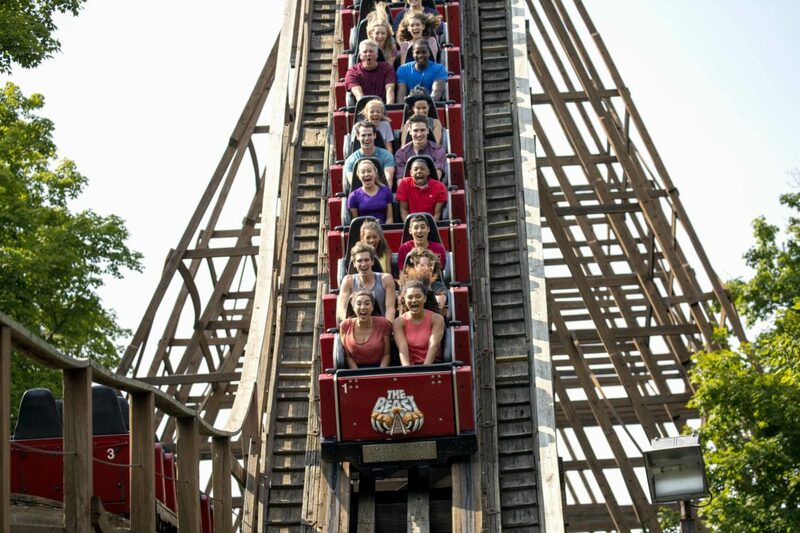 Riders feel the fury of The Beast, Kings Island’s most famous roller coaster, which has maintain the world record as the longest wooden roller coaster since its debut in 1979. 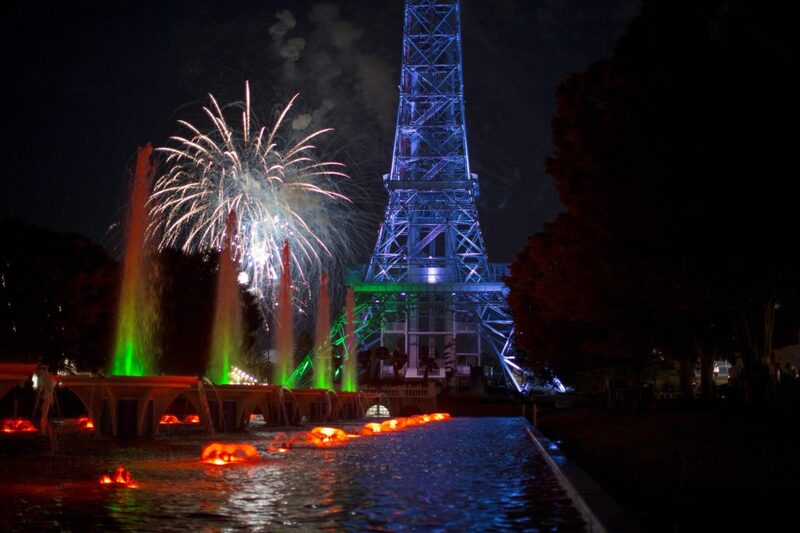 Fireworks light up the sky above Kings Island’s landmark Eiffel Tower and fountains. Thrill-seekers dare to take a high-speed ride on Kings Island’s newest roller coaster, Mystic Timbers, which made its debut this year as the park’s 16th roller coaster. 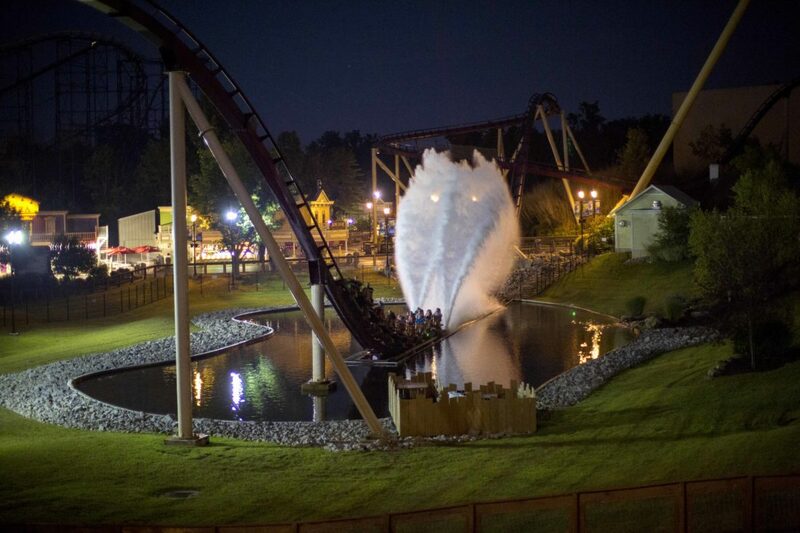 Riders feel the 80 mph speed of the steel hypercoaster Diamondback, which skims a pond with a splash-down rooster-tail effect at the ride’s end, as seen here at night. 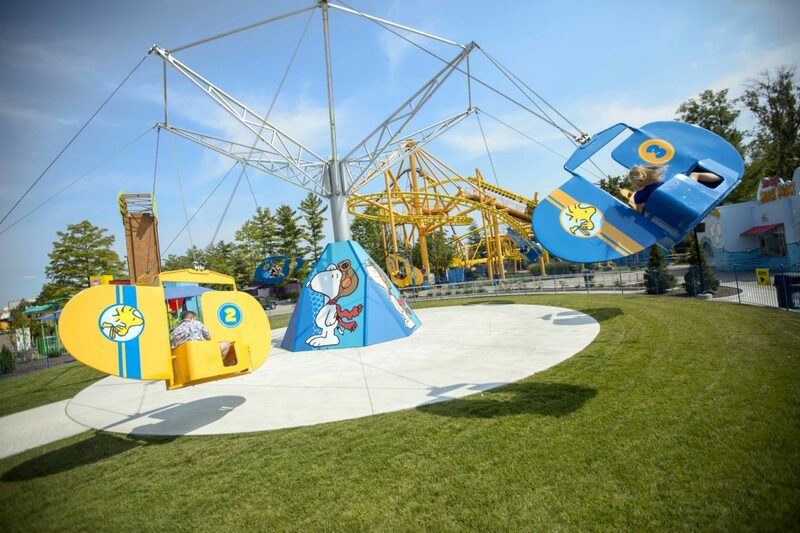 Kings Island’s award-winning kids’ area is now a Peanuts-themed zone called Planet Snoopy. 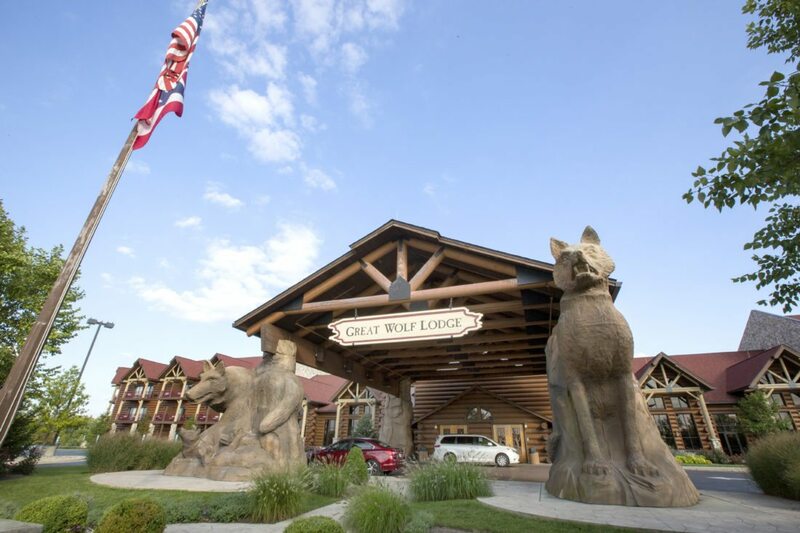 Great Wolf Lodge, located next door to Kings Island in Mason, Ohio, offers family activities, resort-style suites and a huge indoor water park complete with wave pool, kids zones and several water slides. 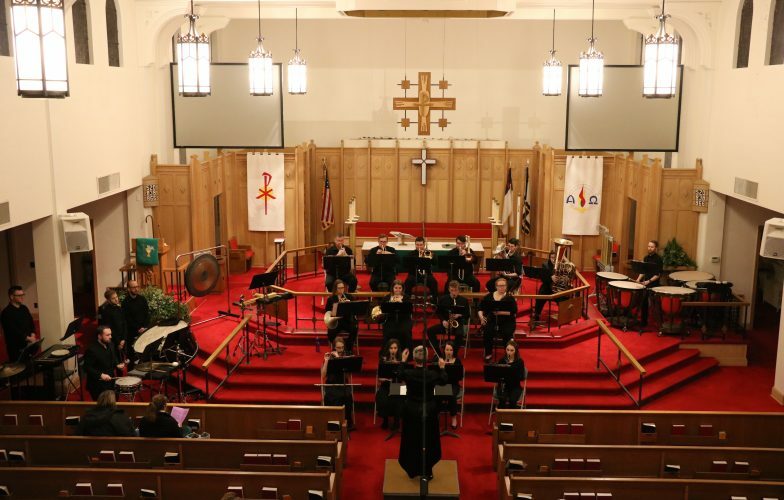 MASON, Ohio — Summer 2017 is winding down, but for those looking to squeeze in one last adventure before the leaves turn, there’s still time to make memories at one of the region’s most beloved family destinations. Best of all, it’s just a one-tank road trip across the Buckeye State. Until two years ago, I had not visited Kings Island since I was a kid — which means it had been a good while. A lot has changed at the amusement park since the late ’70s and early ’80s, but the unique atmosphere has remained the same. 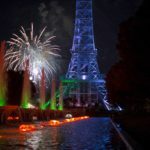 Obviously the Eiffel Tower (a replica of the Paris landmark, one-third the original’s height) and the iconic fountains that stretch between the tower and the main entrance still wow visitors as they enter the park. First opened in 1972, Kings Island was built with the intention of relocating amusement rides to higher ground from Coney Island, a popular riverside amusement park in Cincinnati that had been plagued with flooding issues. Kings Island was built northeast of Cincinnati near Mason, Ohio, on a sprawling piece of land located between Interstate 71 and the Little Miami River. 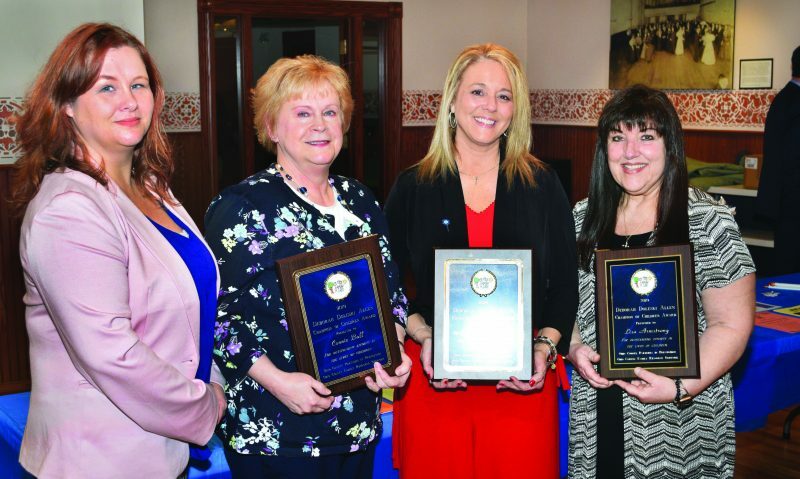 It’s about a three-hour, all-interstate drive from the Ohio Valley, and ever since opening day, the park has continued to build a rich history that has left a stamp of fond memories on generations of families across the nation. In addition to the fountains and Eiffel Tower (which had been planned for Coney Island), the original featured attractions at the park included the Racer — a lengthy, twin-train wooden racing roller coaster that still thrills riders today. The grand carousel was relocated to the park from its original home at Coney Island, and it still serves as an eye-popping centerpiece of yesteryear at the park today. Taft Broadcasting Company was the original owner of Kings Island. The company at that time was associated with Hanna-Barbera Productions, a major animation studio that for decades brought fame to Saturday morning television cartoons ranging from The Banana Splits to Scooby-Doo, The Flintstones, Captain Caveman, Yogi Bear, Huckelberry Hound, Hong Kong Phooey, The Jetsons and many others. 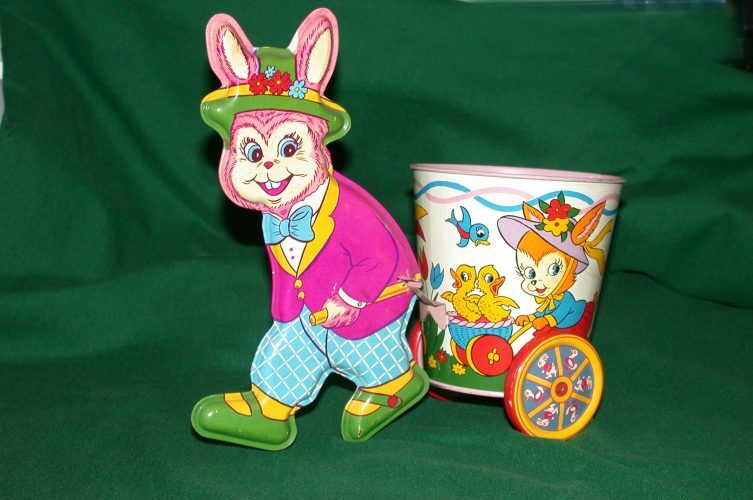 These popular characters were a common site at Kings Island in the 1970s. The new amusement park got a national boost with publicity in the early ’70s when popular ABC sitcoms “The Partidge Family” and “The Brady Bunch” filed episodes at Kings Island. Starting with the popularity of the Racer, the park slowly but surely began building a reputation for being a home to world-class roller coasters. The Screamin’ Demon debuted in 1977 as the first forward- then backward-looping roller coaster in the country. It was 1979 when Kings Island raised the bar with a roller coaster that to this day still holds records and tops lists among the world’s most finicky roller coaster enthusiasts. When it opened, The Beast was the biggest, longest and fastest wooden roller coaster in the world. This beastly theme and rattling experience of barreling down lengthy stretches of track through thick woods make for a unique and unforgettable ride. 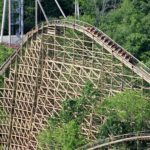 To this day, The Beast still holds the record as the world’s longest wooden roller coaster at 7,400 feet and — for good reason — remains one of the most beloved amusement rides in the world. The ’80s at Kings Island saw more firsts in the roller coaster world with the introduction of The Bat, the world’s first suspended roller coaster. King Cobra debuted as the world’s first roller coaster designed with stand-up “seats.” Both are now defunct (although another hanging coaster at the park currently dons the name “The Bat”), but were revolutionary at the time and blazed a trail for ride innovation. By the 1990s, a new water park was opened at Kings Island, and the park’s chain was purchased by Paramount, which began the process of changing ride themes to coincide with the company’s motion picture studio releases like “Top Gun” and “Face/Off.” In the 2000s, Hanna-Barbera Land was transformed into Nickelodeon Central. 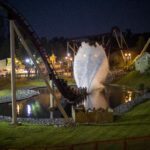 Son of Beast opened as the world’s tallest, fastest and only looping roller coaster, but its loop was later removed, and the ride was closed in 2009 and eventually demolished to make way for the Banshee, the world’s longest inverted roller coaster, in 2014. Before the ($24 million) Banshee, the 80 mph hypercoaster Diamondback was the park’s biggest single investment ($22 million), debuting in 2009 as the tallest and fastest roller coaster in the park. In 2006, Kings Island was purchased by Cedar Fair, which also owns Ohio’s other amusement park mecca, Cedar Point in Sandusky. Cedar Point is the second oldest amusement park in the nation, is the flagship of the company and is known as the roller coaster capital of the world, boasting extreme versions of record-breaking roller coasters. 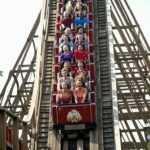 But where Cedar Point pushes the envelope with extreme coasters, Kings Island seems to pride itself on coasters, rides and an overall park atmosphere that focuses on character. It has the big ticket thrills that Cedar Point offers, but maintains more of a laid-back, hometown vibe a park like Pittsburgh’s Kennywood offers to folks in the tri-state area. After rediscovering all of them, our family easily decided Kings Island is our favorite amusement park within a reasonable driving distance from home. Today, Kings Island boasts the world’s largest animatronic dinosaur park — Dinosaurs Alive! 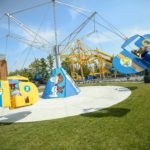 The park also features its award-winning kids’ section — the Peanuts-themed Planet Snoopy; live stage shows; great food; classic family rides and many big-thrill, non-coaster rides. Admission to the park gives visitors admission to the adjacent Soak City water park as well. 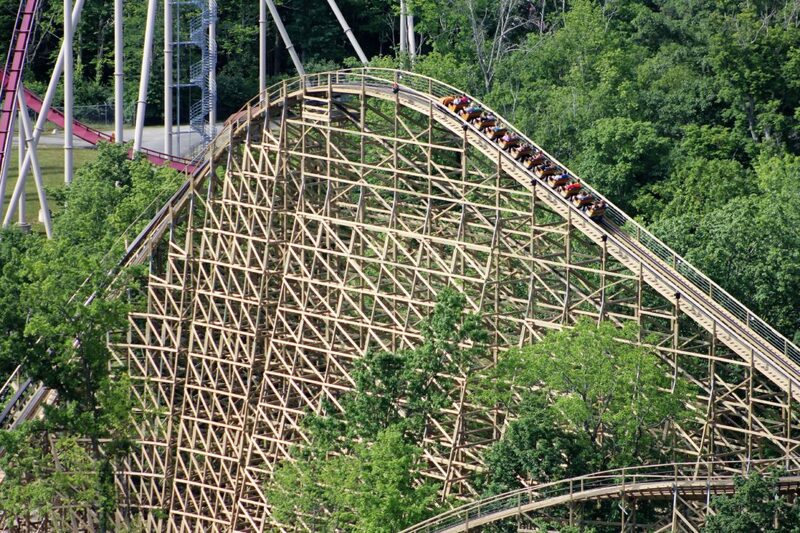 Mystic Timbers boasts 330,000 board feet of yellow pine that has a fresh-cut look. The coaster’s train careens through the woods at 53 mph through a series of drops, tilts and bunny hops before ending up at (of course) the forbidden shed. I won’t ruin the secret, but I will offer a world of advice for riders — get back on several times, because there are actually a number of different endings! 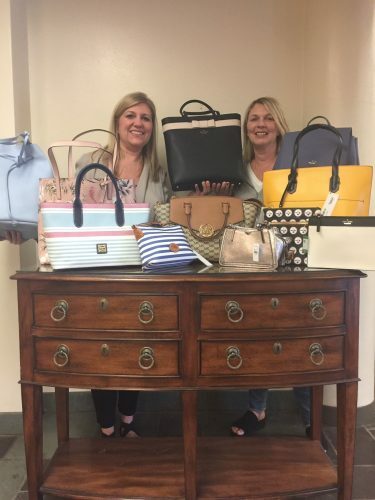 — Check out the park’s website beforehand and see if there are any package deals that may end up saving you time and money. For instance, we regretted not buying a FunPix package, which for one price gives you unlimited digital pictures all day. Your picture is taken upon entering the park and at several locations throughout the property, including at the most thrilling point on most of the roller coasters and at the end of the log flume ride. You can see these keepsake portraits immediately after exiting the rides. There’s also a short video of your Mystic Timbers ride with animation superimposed, which is included in the picture package as well. There are drink and dining deals that may help you save a significant amount of money if you plan to be in the park all day and eat there. — Fast Lane passes can be purchased as well, giving you the ability to skip to the front of the line all day, avoiding wait times. On busy days when lines are long, this may be a wise investment if you don’t want to spend hours of your day waiting to ride. We’ve lucked out by showing up on days when it was supposed to rain, but ended up only seeing a few drizzles or short periods of showers. Local people with season passes tend to avoid the park on these types of non-perfect weather days, which significantly reduces the number of people in the park, resulting in no need to spend extra money on a Fast Lane pass. — If you are an amusement park and water park fan who has the time and money to do it, you may want to plan to visit the park on two consecutive days, with one day dedicated to time at Soak City. Budget some time to see the shows, too. With all the rides, shows and attractions available at Kings Island, it’s almost impossible to do all the things on your checklist in one day. — Being three hours away by car, a trip to Kings Island will likely require a night or two’s stay at one of the many hotels in the area. On a tight budget, it’s not hard to find reasonable rooms at hotels within a mile or two of the park. If you want to go big and make a mini-vacation out of your trip, Great Wolf Lodge is located literally right next door to Kings Island. Great Wolf Lodge is part of the largest family of indoor water park resorts in North America. It has resort-quality suites, kids’ activities, restaurants and shops, and a huge indoor water park complete with several awesome water slides, a wave pool, kids areas, showers, food court, gift shop and more — all under one roof. The resort opened in 2006, and a walking path takes you along the parking lot directly to the front gate at Kings Island. 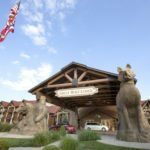 While you will spend a good bit more for a stay at Great Wolf Lodge, you’re paying not only for a top-notch room, but also two full days of access to the water park for each night you stay. Factor in that you also avoid paying the parking fee at Kings Island, and you have a place for the family to go in case of inclement weather. Kings Island and Soak City Water Park are open daily through Aug. 20, and thereafter on weekends through Labor Day. The park reopens for the Halloween Haunt on weekends from Sept. 22 through Oct. 29. Winterfest takes place on select dates through the holidays beginning Nov. 24. Great Wolf Lodge is open year-round. For more information on Kings Island, visit www.visitkingsisland.com. For details about the Mason Great Wolf Lodge, visit www.greatwolf.com/mason.